I just came across this happening in February. I've never participated in a read along and thought it sounded interesting. I don't own the book though (and don't frequent the library). So I checked out the price of the Kindle book on Amazon and found that it is free for the Kindle. Of course, I downloaded it. I've seen the movie before and liked it. It ranks up there with Anne of Green Gables. So, long story short, I'm going to take part (or try to). Here's the details. Movie watching: March 4 or 5: We'll let you know what day and what time as it gets closer. 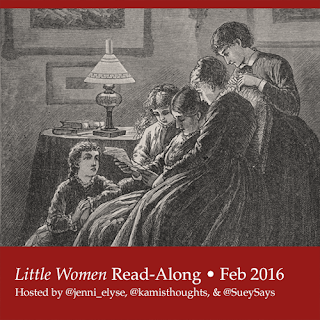 We'll be chatting and tweeting throughout the month using the hashtag #LittleWomenRAL. Please, let us know what you think as you read! That's always so fun, the impromptu discussions! Awesome! So glad you'll be joining us! And so glad to introduce you to the fun that are read alongs! Yay! Thanks for joining us! I'm excited to see all the comments and discussions. I hope you enjoy our read along! I'm so glad you're joining us! :D I hope you have fun! If I enjoy reading Little Women as much as I enjoy watching the movie, I'll have to check this book out.